Ever since I joined the same gym as my friend, I've been faithfully going to Yoga classes twice every week, pilates once a week and using some of the machines to increase my cardio. It has been 4 months since I started my gym regime and I'm glad to announce that I've successfully converted 1kg of fat to 1 kg of muscle! According to the gym's Fat Analyzer, anyways. I'm still not quite there yet but I recognise that my gym efforts are helping me keep myself mentally sane. Some what. I am very stressed out at work and my to-do list gets longer faster than I can cross things off. I bet that all you working ladies feel the same way. 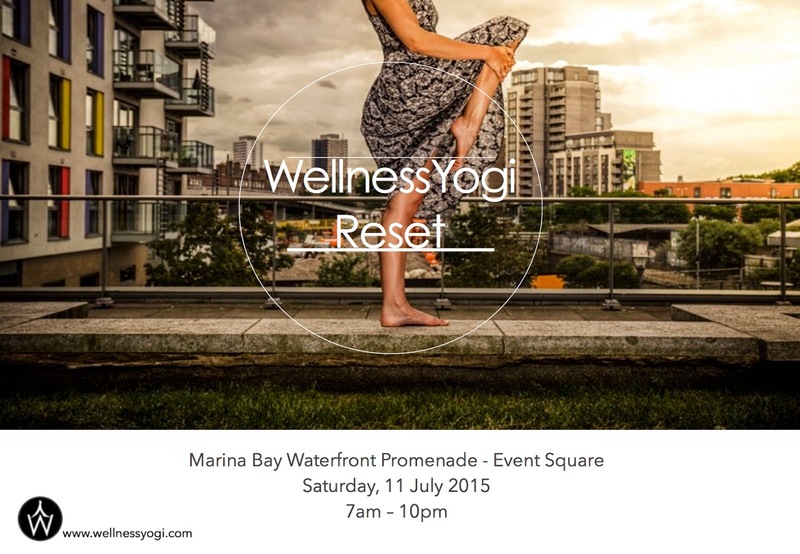 As such, said friend and I have organised an event aptly named "Wellness Yogi: Reset" and it will be held on Sat, 11 July 2015 at the Waterfront Promenade. This is because we ourselves are trying to Reset our crazy busy lifestyles and go back to a place where we're at peace, calm and ready to be the happy women that we deserve to be. SAVE THE DATE! Pencil it into your calendars now! Further details will be out later while we settle all the licenses required for this event. We're planning to have a series of workshops that include yoga, pilates, life coaches teaching you how to manage stress in your lives, nutritionists to talk about healthy meals vs. diets and there will also be a bazaar that's open to the public! We hope to fill the Wellness bazaar with stalls selling cold pressed juices, healthy meal options, quick massages and/or beauty fixes. If you are interested to rent a bazaar stall or sponsor goodie bag items, please feel free to contact me at passhen.sg@gmail.com to discuss! If you know anyone who would be interested, do share this with them too! 'Like' Passhen on Facebook here. OR 'like' WellnessYogi's Facebook page here.